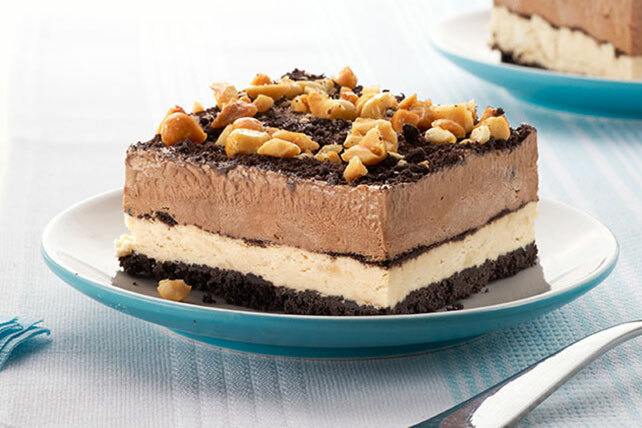 This chilled mud pie is stacked with chocolate pudding and peanut butter fluff for a crunchy, creamy, icy take on a restaurant favorite. Line 9-inch square pan with plastic wrap, with ends of plastic extending over sides. Mix 1-1/4 cups cookie crumbs and butter; press onto bottom of prepared pan. Refrigerate until ready to use. Beat cream cheese spread, peanut butter and sugar in medium bowl with mixer until blended. Gently stir in 1-1/2 cups COOL WHIP; spread over crust. Top with 1/4 cup of the remaining cookie crumbs. Beat pudding mix and milk in same bowl with mixer on low speed 2 min. Stir in remaining COOL WHIP; spoon over dessert. Top with remaining crumbs and nuts. Freeze overnight. Remove dessert from freezer 20 min. before serving; let stand at room temperature to soften slightly. Use plastic wrap handles to lift dessert from pan before cutting into squares.